Initially, a red “fan” rotates over a green background – obviously. Now gaze steadily on the central fixation targe; let your gaze hang, so to speak. After a few seconds you will notice: the green under the fan is greener than on the surrounding ring, and the red fan blades are redder then the central red disk which turns slightly greyish. You can swap the colours with the eponymous button, select presets other than “red on green” with the pop-up menu, or freely select any colour when clicking on the colour fields. When you select “gray” as one colour (e.g. one of the bottom four entries of the pop-up menu), you will notice that behind the fan the gray will change its hue subtly to the opponent colour (e.g. cyan for a red fan). Changing rotations speed (preset to 15 rotations per minute) has little effect. This is standard colour adaptation stuff, think afterimages. When the colour is visible continuously, adaptation leads to desaturation; interruptions by another colour (especially by a (nearly) opponent colour) counteracts this desaturation. The neighbouring figure tries a simplified explanation in the CIE colour triangle, where additive mixture and adaptation appear as vector operations. Example is for red fan on green ground: Initially, the green locus is at the top of the triangle (1). Then adaptation desaturates toward neutral (2); that’s the green we perceive at the outer ring. 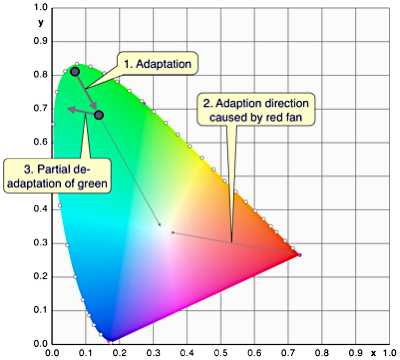 The intervening fan, however, adapts towards neutral from the red end – add this to the adapted green position, and perception of the green under the fan moves towards the end of the arrow (3, “de-adaptation”). The main locus of these types of colour adaptation is at the retinal ganglion cells (Zaidi et al. 2012). The Lilac Chaser brings out the strength of colour adaptation in a much stronger way. Bernhard Rassow mentioned this effect to me (thanks! ); it sounded intriguing, so I programmed it. It must be well known, but we haven’t found a source so far.